ILOILO CITY — Large fishes have been spotted near the shore of Carles in Iloilo province’s Gigantes Island based on testimonies of local fishers, as gathered by a team sent by the local government unit to probe the stranding incident of a Sei whale species (Balaenoptera borealis) off the coast of Barangay Gabi on February 4. The report, furnished by the Fisheries and Aquatic Resources Office of Carles to Bureau of Fisheries and Aquatic Resources (BFAR) regional director Remia Aparri, said the marine animal got stranded while it was “in pursuit of target food”. Their target food is presumed to be abundant in the near-shore areas due to the implementation of the marine protected area and the continuous campaign against illegal fishing, the report said. Based on the report, at around 5 a.m. on Feb. 4, the crew of passenger-cargo boat “Rommel”, which plies the Gigantes Island to Estancia and vice-versa route could no longer lift the anchor rope of the boat. “They found out that there was a gigantic fish strangled and gripped on that rope lifeless,” Aparri said, quoting the report. The incident was reported to Carles Mayor Siegfredo Betita who also sought advice from BFAR. After consultation, the local government unit deployed LM Marcelo, a marine biologist and a United States Peace Corps Volunteer for Coastal Resource Management, to undertake the documentation. The male whale has a length of 10.48 meters and weighed 2.8 tons. While the cause of its death remains unknown, it is believed that it was due to strangulation because the rope was found tightly gripped around the whale’s body. 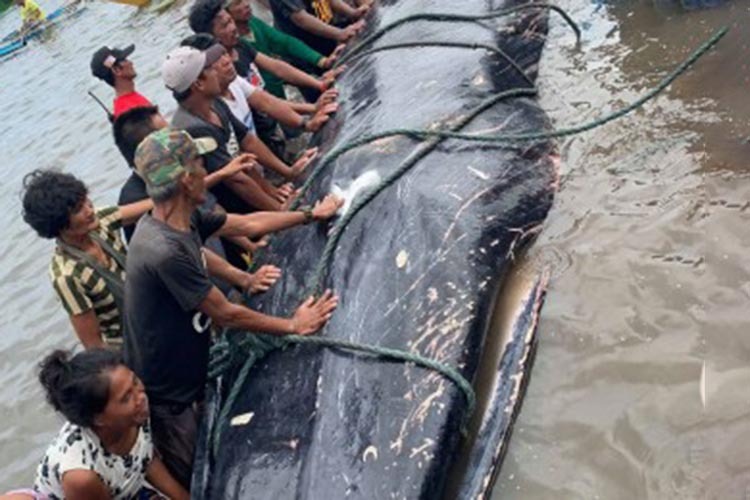 Barangay officials decided not to bury the whale and instead securely wrapped the animal in a concrete mixture that resembles the image of the whale species. They also made sure that the decomposing body of the whale will not leak to avoid posing hazard to the community. “The structure will also serve as remembrance that once in the history of Barangay Gabi, there was a big fish that made aground on its shore. Barangay Gabi folks believe that the stranding incident is a blessing and a perpetual reminder that protection of marine resources is serious and indeed a beneficial option,” Aparri quoted the report. The species is listed in the Appendix I of the Convention on International Trade in Endangered Species of Wild Fauna and Flora, which contains animal and plant species that are endangered, hence catching, possessing, killing or trading it is prohibited, Aparri said. Section 102 of Republic Act 10654 that amended Republic Act 8550 or the Philippine Fisheries Code of 1998 provides administrative offense of five times the value of species or PHP500,000 up to PHP5 million, whichever is higher for those caught fishing, or taking rare, threatened and endangered species.